Sprinkle gelatin on cold water to soften; dissolve over hot water. Cool gelatin slightly. 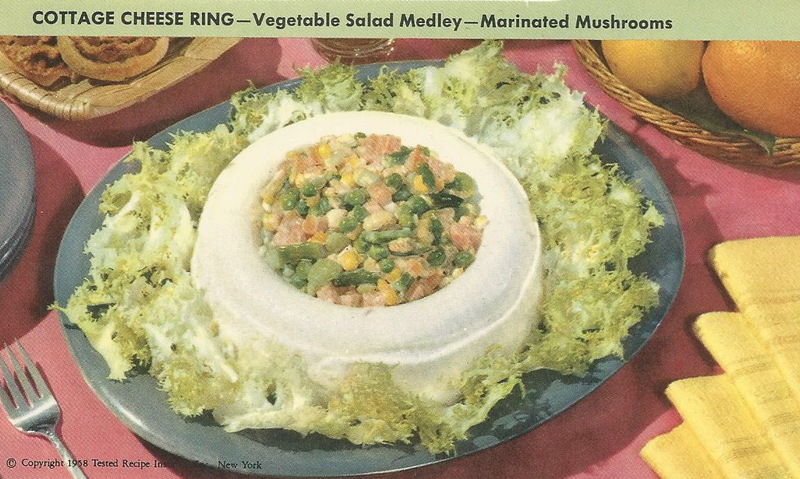 Combine cheese and dressing; stir in gelatin, parsley and the next 6 ingredients; blend well. Fold in cream. Turn into 5-cup ring mold; chill until firm. Unmold gelatin salad on a platter. Garnish with salad greens. Fill the center with Vegetable Salad Medley. Makes 8 servings. Drain 2 cans (16 oz. each) mixed vegetables; turn into a bowl. Combine 1/2 cup salad oil, 2 Tbsp. vinegar, 1/2 tsp. garlic salt. dash Tabasco sauce, and 1/4 tsp. paprika. Beat with a rotary egg beater. Pour over vegetables; toss to mix and chill. Buy large, firm mushrooms. Wash mushrooms; drain and cut into thin, lengthwise slices. Put mushroom slices into a screw-top jar. Pour enough French dressing over mushrooms to cover them. Cover jar tightly and store in the refrigerator until ready to use. Drain mushrooms before serving and place on crisp lettuce.